I teach courses at various levels: 100 (lectures), 300 (seminars) and 400 (seminars & tutorials), including -- Introduction to U.S. Politics; the Politics of U.S. 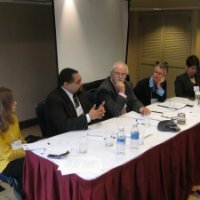 Citizenship; Social and Racial Justice Politics: Quakers in America; Black American Politics and Political Thought; and Faith & Race in U.S. Political Life. I am currently designing three separate 300 level seminars: 1) Race, Class and the Geographies of Housing, 2) Black Gay Quaker Political Activist Bayard Rustin, and 3) Puerto Rican Revolutionary Leader Pedro Albizu Campos. 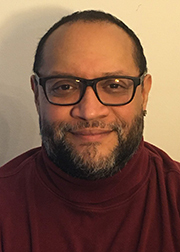 I am a First-Generation college student who holds a dual Ph.D. degree in political science and Historical studies from The New School for Social Research, an M.S. in General Administration from Central Michigan University, and B.A. in Political Science from Fairleigh Dickinson University, Florham Park/Madison, N.J. I have studied British politics, history and literature abroad at Wroxton College in Oxfordshire, England (FDU), and democratic and constitutional theory at the Trans-regional Center for Democratic Studies (New School). I have been active in working class politics (starting with my own lived experiences), and labor organizing/collective bargaining since the early 1990s, which also inform my intellectual, research and teaching work. My scholarly interests include studies in American political development; U.S. Quakers, race and citizenship; interpretive policy analysis (IPA); black American politics and political thought; Latino/a politics in the U.S. & border studies; interpretive & qualitative methodology/methods; U.S. intellectual History; and public leadership (https://www.youtube.com/watch?v=7oafbLDV6X8). Some of my academic/intellectual work has appeared in: Journal of Public Affairs Education, Journal of Race and Policy, Political Science Quarterly, Annales: Ethics in Economic Life and with the University of Virginia Press, among others.